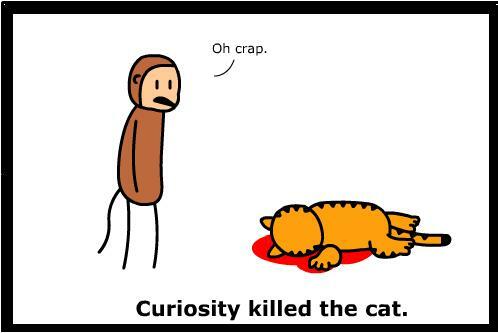 When did we stop being so curious? As a kid we thought nothing of exploring the world around us. We wanted to eat, touch, and ask a million (sometimes annoying) questions. Our minds were not clogged full of expectations and preconceived notions. Then we “grew up” and became adults. We stopped being so curious and turned into these rigid human robots. No more taking risks, no more asking anything other than routine questions. We became like sheep, herded along with the masses. 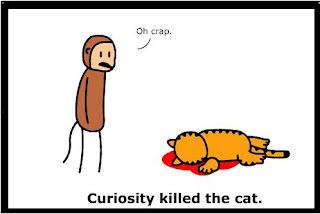 Why, you’re probably asking (while staring at the cat in a pool of blood) is the big deal about being curious? If you only look at things one way, then you will probably miss out on some great opportunities. History has shown us time and time again how the curiosity of one person has led us to new discoveries. Thomas Edison would have never discovered the light bulb if he was satisfied just sitting in the dark. This week break out of your routine just a teensy bit. Watch a foreign film, do something different when you get home from work, or eat food from a different culture (Ramen Noodles do not count!). Get rid of the phrase, “I’m bored”, and instead get off your nalgas and do something instead.